T’ai chi ch’uan (Tai ji quan) is a tried and tested Chinese system integrating internal martial art, gentle exercise, meditation, and a preventative health regime. As such, it is ideally suited for older people, as has been recognised in Chinese communities for three hundred years. Though ideally best learned while young, the simpler forms of T’ai chi, and exercise or isolated stances, can be quickly learned by seniors. If trained on a regular basis, the gentle performance of the form and exercises, along with the slow controlled breathing pattern, using the full capacity of the lungs, helps to eliminate tension and stress, and increases oxygen intake. The correct use of the fully flexed diaphragm in breathing, in order to access full lung capacity, also gently massages the internal organs. The emphasis on a relaxed sunken rooted T’ai chi stance in all the positions of the form, leads to greatly increased stability and balance. This is further enhanced by the correct alignment of head, neck and spine, to give maximum stability and ease tension. T’ai chi form and stance training are invaluable for seniors in reducing the risk of unsteadiness and falls. The slow repetition of the form and stances, along with the slow deep, regular breathing pattern, also promotes the development of a great sense of ease and bodily awareness. 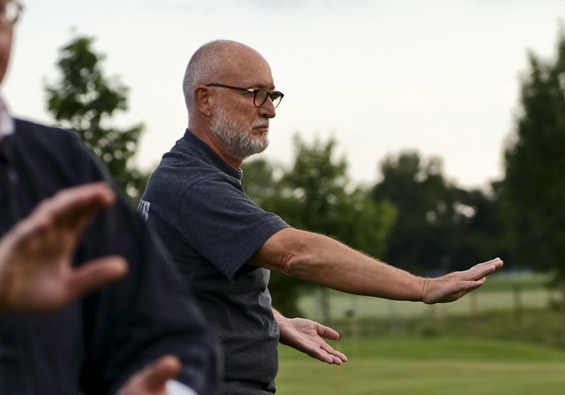 The T’ai chi practitioner’s sense of their own breathing, their positions, movements and areas of tension in the body, are increased over time. This kind of bodily self-awareness is invaluable for seniors, as it promotes a useful way of monitoring their own internal systems, and alerts them any changes and to aches and pains, before they become major problems. The areas of tension or aches can be eased by controlled directed breathing and by ensuring these areas are free of tension. This is why T’ai chi is so popular in Chinese communities as a preventative health regime. The evidence of clinical studies of T’ai chi ch’uan practitioners has shown that many chronic and long term conditions can be controlled and symptoms reduced by regular practice. Sufferers from heart problems have experienced the lowering of blood pressure and of LDL cholesterol levels. Other research has found the diabetes sufferers have lowered blood sugar levels and increased energy and vitality levels after only six months of regular T’ai chi practice. Other studies have shown how regular T’ai chi has reduced back pain, and also reduced falls and fractures, among groups of seniors who were prone to them. Finally, the increased sense of vitality promoted by T’ai chi, and achievement in learning a new skill, are known to have greatly enhanced their lives, and increased the confidence and positive outlook of many senior practitioners. Performing T’ai chi gently in a pleasant environment, preferably under trees, early in the morning, alone or with others, is a much greater health and energy boost than an hour sweating on a treadmill in a gym with TV or headset on.